Front cover of the eBay copy. 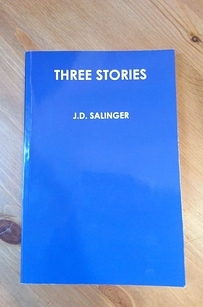 J. D. Salinger's aptly-named Three Stories is a collection of three unpublished short works written between 1942 and 1946, one of which was, until recently, particularly rare and sought-after. The first story in question (i.e.,. The Ocean Full of Bowling Balls) was originally written for Harper's Bazaar, though Salinger ultimately withdrew the submission before publication. The plot centers around the precursors to characters from his acclaimed 1951 novel, The Catcher in the Rye. A copy was donated to Princeton University, with the understanding and agreement that the story was not to be published until 50 years after his death (January 27, 2060, being the earliest possible date). It is currently available for strict viewing (two forms of ID required) at Princeton University, during which time the reader must be accompanied by security guards. The latter stories (i.e.,. Birthday Boy and Paula), while not necessarily under any clause to remain unpublished, are still considered rare in their own right, and are, similarly, available for viewing at the University of Texas at Austin. Many had come to terms with the fact that short of traveling to the respective universities in person, they wouldn't be reading the stories anytime soon. Then, in mid-September of 2013, the unbelievable happened. An unauthorized collection of all three works, published under the name Three Stories showed up on eBay. The book, which was apparently printed in 1999 in a very limited run (the auctioned copy being number 6 of only 25) sold for a measly 67.50 pounds, which is incredibly cheap given its historical significance and reputation (particularly that of The Ocean Full of Bowling Balls). While many a fan likely waited with bated breath at the proposed fate of the sold copy, the trail ran cold after just a few weeks, and it seemed that the auction had been and gone, with the spoils likely now in the hands of a private collector. However, not long after the auction's end, something even more extraordinary happened; in late November, the entire book was leaked (in .pdf form) anonymously, by the apparent buyer. The news spread like wildfire, quickly reaching Salinger scholar Kenneth Slawenski, who (while in disapproval over the ethical implications of the leak) confirmed that they were indeed genuine, matching his own private copies. Said .pdf is now widely available via filesharing websites. Since the book's leak, fans have been torn by the choice of whether or not to read it, against Salinger's wishes, or to avoid it, in honor of his request. Either way, this historical piece of literature is now available for all who wish to partake in reading it, thanks to leak's anonymous source. ↑ Archive of the aforementioned 2013 eBay auction, courtesy of the Wayback Machine. Retrieved 18 Jan '14. ↑ thepiratebay.se torrent download of the leaked .pdf file. Retrieved 18 Jan '14.